Gorgeousness as usual Trace, I love this idea and even had a go myself yesterday. Hope you don't mind. I'm still using your tips and techniques from class so I'm foot loose and fancy free with it. One thing I can't agree with is that you can't kill begonias.... because I CAN KILL them and have done! It appears they don't like to be watered too much and here that's the norm unfortunately. Getting h'eggscited now (pun intended) because the GBBO starts tomorrow!!! I don't think I've baked anything since the last baked off. THis is fabulous.... a framed insight into your week - it could be a book with the words underneath...like poetry! Love it - very inspiring! Love the little owl mug and yep... cant kill begonias! 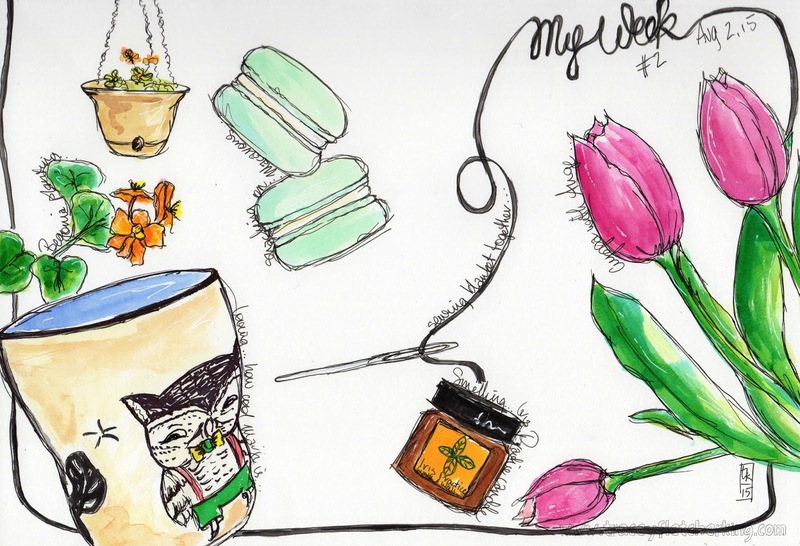 I love this concept of arting your week on one page Tracey! Really loving the illustrations with the words along side of them too. Nice, am loving these pages. I am enjoying a Gratitude journal and it lifts my mood as well. Lucky owl to be part of such a glorious week. Such a great idea to capture life week by week on a page. Really enjoying your illustrated week pages! May have to give that process a go myself! Sounds like the perfect week! Loving this journal type painting! I will email you tomorrow as I will finally have some spare time! Oh what fun it is! Can't wait to see your blanket! Love Marji too..such a great artist!! Wonderful painting of your productive week! I LOVE this!!! ~ especially that adorable owl mug! :) What a sweet friend! Hmm...sewing ~ oh, my...I'll add that to the list of things for us to do when you pop over for tea! I will need some tips! Lovely, lovely work...and, capturing your week like this is TEALIGHTFUL! Hugs! What Shoe Been Up To?